Heidi with the famous Sarawak dolls she knitted. 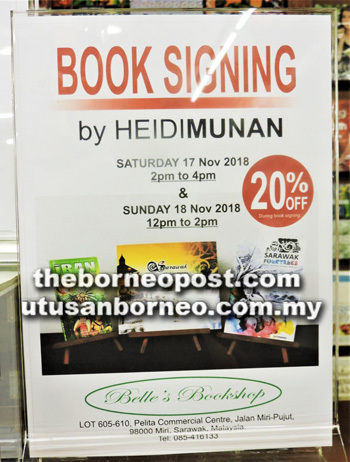 THE Resort City of Miri saw well-known Sarawak writer Heidi Munan meeting fans and enjoying two days of book signing at Belle’s Bookstore, Pelita Centre, recently. Many parents and well-wishers came for the two-day event, organised by the manager of the bookstore, Sophia Soo, and enjoyed a 20 per cent discount on sales. 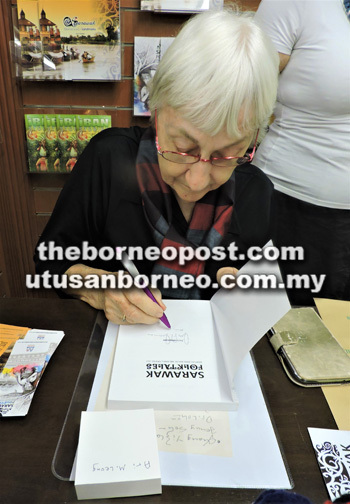 Heidi Munan started gathering a good readership from her early book titled ‘Cultures of the World — Malaysia’ which went on to become one of the most widely read books not only by young people in Malaysia but also those who want to know more about the country. Heidi signs a book for Dr Loh Yunn Hwa of Miri. It’s a book that Malaysians read to know more about themselves. And surprisingly, it’s not written by someone born and raised in Malaysia but by a Swiss-born woman brought to Malaysia by marriage. She followed up on that book with another titled ‘Culture Shock! Borneo’. She is also the author of ‘Sarawak Crafts’, another admirable work. As Sarawak Museum bead curator, Heidi wrote the much-acclaimed ‘Beads of Borneo’ which is not only an extremely good reference book but also much sought after by bibliophiles. 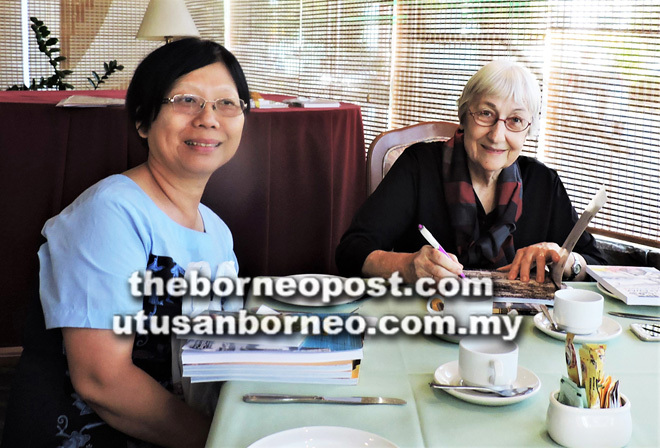 Her authorship and knowledge in her field have helped make Sarawak, if not Borneo, a preferred venue of many international conferences on beads and beadworks in the past decade or so. Heidi has been associated with Sarawak since she moved here in 1965 at 24 after marrying a Sarawakian, Sidi Munan, a prominent Iban personality and well-known newspaper columnist. 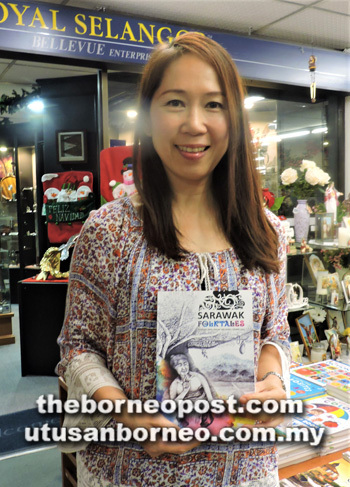 Her love for Sarawak and its people has led her to write many books, including her latest three — ‘The Historical Landmarks of Sarawak’, ‘Sarawak Folk Tales’ and ‘Iban Folk Tales’. The book-signing flyer for the event at Belle Bookstore. Definitely, many will be looking forward to reading this book. Heidi has also shown how great her love for crafts and knitting is. And this book will definitely be a culmination of her works, inspired by that love. of St Teresa’s School’ (2010). Another remarkable book she wrote some years ago is ‘Food Heritage of Sarawak — A Cultural Perspective’ (2012). Those who seriously like to know more about food in Sarawak and the differences of the different ethnic cuisines, should pick up a copy. Published by the National Heritage Department, the book features the food cultures of all the different ethnic groups in the state — from ordinary chores of finding and preserving food to food-related taboos and functions. A significant grouping, led by Heidi and her friends, is Crafthub, a non-profit organisation. Besides holding events, it also produces a very good magazine called Crafts. 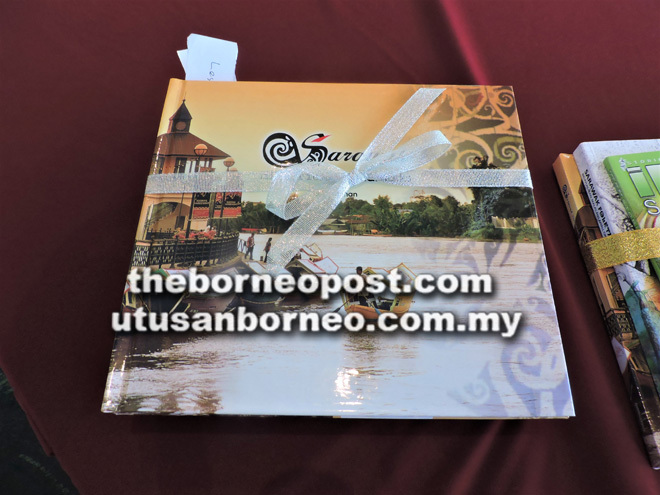 A long-time friend, Lesley Linggod, told thesundaypost Crafthub aimed to promote and market Sarawak handicrafts in an economically viable way with international standard quality control. Heidi signs a book for a buyer. Heidi is a director of Crafthub and she sees to it that a very high standard is maintained. “I believe with Heidi’s knowledge and guidance, the many ethnic groups in the state will be able to showcase their crafts and living skills. “Crafthub was set up about 10 years ago and since then, the members have really done a lot to promote Sarawak arts and crafts and the skills to produce them,” Leslie said. Heidi herself is adept at knitting and has created many interesting knitted ethnic dolls which have been purchased by people the world over and are especially popular with tourists. Book signing is an event which introduces a writer to readers, usually in a bookshop. It’s usually organised by the bookstore or friends to promote the writer, the book and generally bibliophily. Today with e-book making an inroad in the book business, competition is stiff. Some buyers who come for the book-signing may want the writer to add a message — which becomes a dedication. Usually, a signature from the author adds to value of the book for collectors. It is hoped that such an event in malls and bookshops will encourage the young to read more. Another book entitled ‘Sarawak Historical Landmarks’. John Green signed all 150,000 copies of the first printing of his 2012 novel, ‘The Fault in Our Stars’. He is an American and an educator who won the 2006 Printz Award for his debut novel, Looking for Alaska. In 2007, in Los Angeles, JK Rowling sat down and cheerfully signed 1,600 books for school kids when she launched her first US book tour. Malaysian Writers’ Society in West Malaysia from time to time organise their annual events which include book launching, book signing and workshops, usually in Kuala Lumpur. Sophia Soo, manager of Belle Bookstore,who organises the book-signing event. Soo said: “We’re glad we organised this event to help promote Heidi’s books. Many customers came and browsed around, picking up and buying books for her to sign. Children were also interested to know what it was all about. Leo Ha, a new writer, said he went to school with Heidi’s husband, Sidi Munan. “I’m now 81 and have seen much of life. I do believe people should write their memoirs — about their dreams and topics they like to share. I can see the bookstore is now filled with so many titles about Sarawak by local and foreign writers. Audrey Uring, a staff of Belle’s Book Store, was happy to see a big crowd turning up for the event. “It’s very interesting to observe this event. People can to relate to the books they are buying and get to know the writer. “I’m happy to gain more knowledge about books these two days and get to see the author,” she said. Mirian Sylvia Fam turned up especially to lend Heidi moral support ‘because she is family’. She happily snapped up several books and had them signed by Heidi. Always cheerful and helpful, Sylvia had also come to take photos of friends and relatives who had dropped by for the book signing. “I’m happy to be here to buy some books and meet people who love reading books. It’s a good time to catch up with Aunty Heidi and the family,” she enthused. 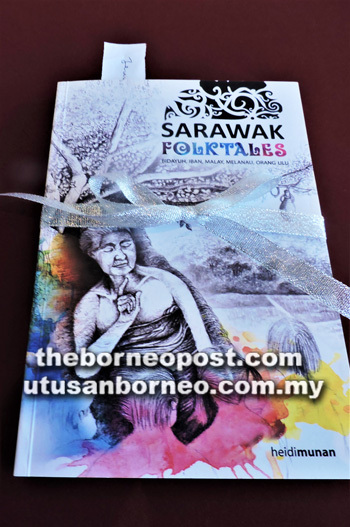 So far, there hasn’t been any event celebrating the works of Sarawak writers despite many local writers having published their books over the past 50 years. 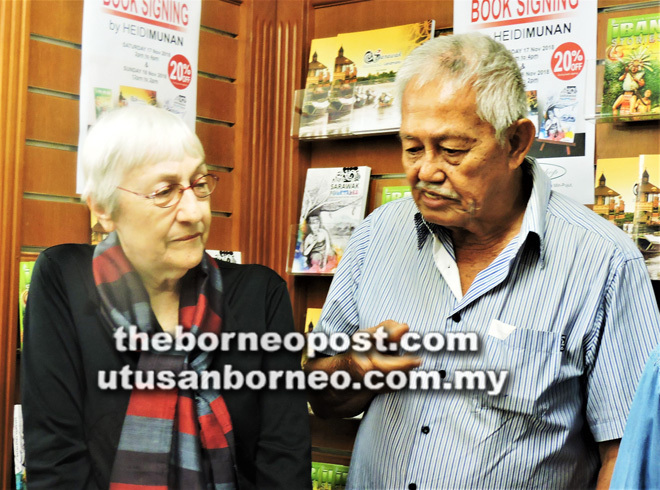 Heidi Munan is certainly blazing a great literary trail in Sarawak. Heidi chats with former police superintendent Leo Ha, who is her husband’s former classmate at St Thomas’ School in Kuching.